I was thinking a Crown of Success spell would be good to help me sell some of my movie scripts, but I don't really want to wind up carrying another mojo around, and I see the spellkit involves one. I'd rather just buy the ingredients individually to do this, without the mojo. I see it otherwise has 9 purple and 1 yellow candle, bath, incense, powder, and 9 herb bath. So what would this be -- 9 herb bath to start, candle and incense work (the candles all at once?) and finish with house washing? Or what would be the same spell without the mojo hand? You don't always have to carry a mojo on you to use it you know. You could keep it, say with your scrips at home and slip it in your pocet only when you do something pertaining directly to the your scrips. You can do a lot of different things with Crown of Success products. You can bathe in Crown of Success bath crystals, light incense in your home, burn candles anointed with the oil, and dust your computer and hard copies of your scripts with sachet powder. 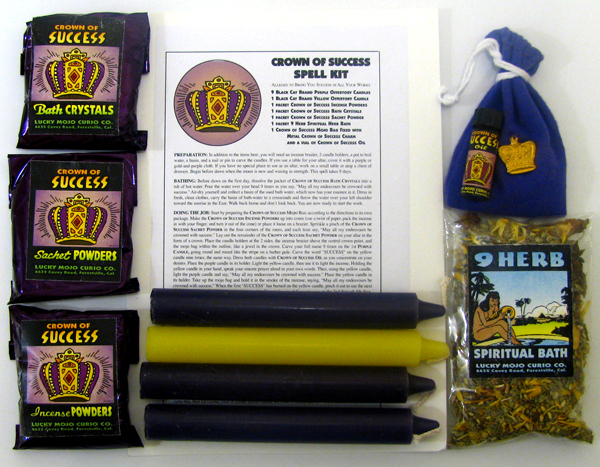 The particular spell in the Crown of Success spell kit is a spell designed with the mojo bag in mind, its not the only Crown of Success spell out there. Burning one larger purple or yellow candle or starting a Crown of Success vigil light are other ways of working. The instructions are only included with the kit. You could also just order the whole Crown of Success spell kit--mojo included and give the mojo to someone else as a gift or as someone else suggested, keep it ony our altar or by your work but not on your person. 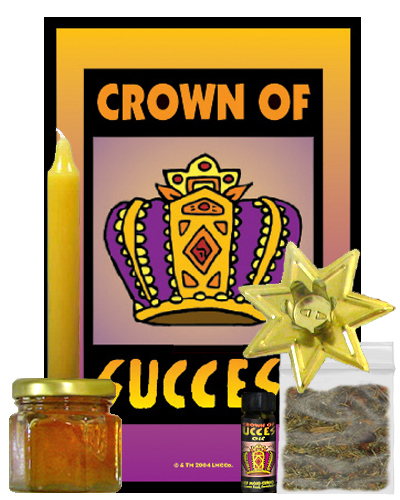 The Crown of Success spell kit we sell is centered around your fixing, dressing, and anointing a Crown of Success mojo hand. If you don't order the kit, you don't get the instructions. You can always start the work off with a Crown of Success bath if you wish to add that aspect to your work. I don't carry my Crown of Success Mojo about on my person either. I keep my success mojo in a nice little box, next to my two other mojos (money and van van, both in separate boxes), AND I dress/talk to it once a week. Hi everyone. I just wanted to take some time out to thank Ms. Cat for her help. About 3 months ago I spoke to her the phone and placed an order for the crown of sucess spell kit for my son. He will be entering high school this September and I wanted him to be picked for one of the top high schools in my area. In my area there about 5. Well, I followed all the directions and involved my son with all the steps and 3 weeks ago we received the acceptance letter to one of the top high school that was on our list I am still excited. I can't wait to put my next order in for him so that all that my son does in school and with his career he will be a sucess. Crown of Success and the other one is Reconciliation. My question is was I also suppose to receive full instructions alone with the Honey Jars? I am aware on what to do with the paper. But for my Crown of Success Honey JarI do not have person name. I do want to succeed in my photography, so instead of a persons name what should I write on my paper? Also when taking a taste of the honey again I do not have a name to recite but that I only want to succeed in my photography, this question is for my Crown of Success Honey Jar. I am also aware that I am to burn a candle on Mon, Wen, Fri. But is there anything special directions I need to do as I am preparing my candle before I burn it? I am aware to anoint my candles with the oils that were given to the apporiate honey jars and also add the herbs and paper into the Honey jar then burn the candle on top of the lid. Also for my Reconciliation I am aware that is best to have the person hair for it work extra strong, which I am planning on getting and I do have a name for my Reconciliation Honey Jar. Is there anything special I need to add other than the person hair and the herbs that were given to me? Also once I have sealed the jar lid and burn the candle am I able to reopen it again? -- and go ahead and ask again here, like you just did. 2) Crown of Success: Instead of a name, use a phrase that describeds the people you want to influence: "My photography clients," or "Photography Buyers for Large Advertising Agencies" or "Wedding Photography Customers." 3) Candle: If you have a name, carve it into the candle with a needle or pin. If you have no name, just write your wish ("Success"). Dress the candle with the oil supplied and pray over it. 4) In addition to the hair and the herbs that are supplied with the kit, you may add what you wish, such as a business card or logo for a company that might hire you for photography work, a photo of the person you wish to influence -- whatever you have that will help personalize the work. 5) You may open the jar and add more things as you go along. Thank you so much for your quick reply!!! Greetings everyone. I will probably be ordering the Crown of Success spell kit after having some success with basic DIY conjure tips I came across on this site. One question I have is about the mojo hand that comes with the kit. I came across some instructions for a a simple CO$ riual and mojo hand on this site, it includes instructions for tying a bag with High John root, pyrite, a chunk of dragon blood and other herbal ingredients. Does the kit come with all the ingredients suggested on that page or should I order them along with the kit? Another question I have is about the best way to execute the work for my situation. I've recently been promoted at my job and hope to prove my self at this position and be promoted to higher paying positions within my company. My direct manager and her boss have provided me with unbelievable amounts of support and have also introduced me to a another business opportunity they are involved in. It is all legal and honest, but they also broke some company policies when they introduced me to their side hustle. Needless to say, this side hustle has much better potential for all of us than out current employer. I want to be successful at both. I;ve read over the free information available on this website and have decided on 2 maybe 3 possible ways to use your products. I guess I'm asking for guidance from people more experienced with this kind of work. My first plan was to buy one Co$ spell kit and adapt it to my situation. I would have included a business card or copy of HR paperwork for both my day job and side hustle or maybe soil from both offices along with personal concerns in the mojo hand and carry that with me. When burning the candles for nine nights and going to the place where I will prove myself I would alternate between both offices each night. Possibly going to both on the ninth night or the one I feel is more important. Another possibility is to buy 2 spell kits along with the materials for one more mojo hand. I would perform a ritual for each business individually. I would add ingredients that would enhance personal qualities for success within each business. Say deer's tounge, pay me, and devil's shoe string for the more sales/face to face transaction based business and power, commanding, clarity and Solomon's wisdom products for the more management oriented job. I would then hide/bury each by each office. I would then carry the third bag around. The only problems I have with this strategy is that it would take twice (maybe three times) as long to do the work and it requires me to view both my current jobs at separate ventures. I feel that skills and talent developed in one would be beneficial in the other. Also, since my manager and her boss introduced me to the side hustle, I think I showed the skills and talent in my day job that they feel will make me successful at other business opportunity. Another option I thought about but have not really decided on is to use the Crown of $ucce$ honey jar kit. Since I have advanced in both businesses because of help from the same two people (not only because they genuinely like me and respect my work ethic, but because my hard work and intelligence makes them more successful at their jobs), I should cultivate as much of that goodwill as possible. This option makes me feel uncomfortable and dependent on them, so I'm not too keen to follow it, but I'm open to advice from those who are more experienced in these matters. I guess my situation can be summed up by sating that I have a basic understanding of how this family of products work and have used it to envision a few ways to use these products to help me reach my goals, but feel I should ask for some input from those who are more proficient at this work. Thank you all for any advice you offer. PeteySmoke wrote: Does the kit come with all the ingredients suggested on that page or should I order them along with the kit? PeteySmoke wrote: Another question I have is about the best way to execute the work for my situation. I've recently been promoted at my job and hope to prove my self at this position and be promoted to higher paying positions within my company. My direct manager and her boss have provided me with unbelievable amounts of support and have also introduced me to a another business opportunity they are involved in. It is all legal and honest, but they also broke some company policies when they introduced me to their side hustle. Needless to say, this side hustle has much better potential for all of us than out current employer. I want to be successful at both. I;ve read over the free information available on this website and have decided on 2 maybe 3 possible ways to use your products. I guess I'm asking for guidance from people more experienced with this kind of work. . This sounds so bad! Just the term side hustle says it all. I am sure the guys at Enron thought the same thing. You better make sure you are protected, because that does not smell good. Crown of Success will not help you if your main job finds out. I actually would be using Cast Off Evil to get rid of this managers, because they sound crooked and unethical. If they can do this to the company, they can turn on you. Keep that in mind. PeteySmoke wrote: My first plan was to buy one Co$ spell kit and adapt it to my situation. I would have included a business card or copy of HR paperwork for both my day job and side hustle or maybe soil from both offices along with personal concerns in the mojo hand and carry that with me. When burning the candles for nine nights and going to the place where I will prove myself I would alternate between both offices each night. Possibly going to both on the ninth night or the one I feel is more important..
See above about "the hustle." PeteySmoke wrote: Another possibility is to buy 2 spell kits along with the materials for one more mojo hand. I would perform a ritual for each business individually. I would add ingredients that would enhance personal qualities for success within each business. Say deer's tounge, pay me, and devil's shoe string for the more sales/face to face transaction based business and power, commanding, clarity and Solomon's wisdom products for the more management oriented job. I would then hide/bury each by each office. I would then carry the third bag around. The only problems I have with this strategy is that it would take twice (maybe three times) as long to do the work and it requires me to view both my current jobs at separate ventures. I feel that skills and talent developed in one would be beneficial in the other. Also, since my manager and her boss introduced me to the side hustle, I think I showed the skills and talent in my day job that they feel will make me successful at other business opportunity..
You have two endeavors going on. One is a legitimate job and one is a job that goes against the legit one, which is different than having just two jobs that are unrelated. Your method works if you had two separate jobs that do not affect each other, but you do not. One job can kill the other job, so you must think of how to protect yourself. When do plan on leaving the side job? Is it quick money? Getting greedy can get you in a lot of trouble, so think long and hard about this. PeteySmoke wrote: Another option I thought about but have not really decided on is to use the Crown of $ucce$ honey jar kit. Since I have advanced in both businesses because of help from the same two people (not only because they genuinely like me and respect my work ethic, but because my hard work and intelligence makes them more successful at their jobs), I should cultivate as much of that goodwill as possible. This option makes me feel uncomfortable and dependent on them, so I'm not too keen to follow it, but I'm open to advice from those who are more experienced in these matters. PeteySmoke wrote: I guess my situation can be summed up by sating that I have a basic understanding of how this family of products work and have used it to envision a few ways to use these products to help me reach my goals, but feel I should ask for some input from those who are more proficient at this work. Your "situation" can be summed up with watching "The Smartest Guys in the Room" about the Enron scandal or reading any book about greed. Thank you for advice and concern Mary. I assure you my secondary (for now) business is honest. Granted, it's quite possible some people in the business may be motivated by greed and perhaps choose to do things dishonestly, but I can't imagine they last too long. You are right to point out that they are two separate endeavors so I need the spells to be separate. I guess I still see them both as "business" and figured one spell would help me achieve success in "business". That vagueness I feel about "business" and "management" is something I'm going to have to address to be successful. I do want to stress that they are bot legitimate jobs. My secondary business doesn't go against my day job. What I'm doing on the side does not in any way go against any company policies. My manager broke a policy when she introduced me to the business, but she did that to help me out and I am grateful. Your response to my thoughts about the honey jar spell was a bit harsh if only because I know these two people and genuinally respect them. Of course you have no way of knowing that and you still make a good point. Management are not your friends. I have worked closely with them for three years and they have developed me as an employee and I can count on their support at all times. All that said, they are first and foremost my managers. Hence the discomfort I mentioned with using this option. Once I got past the accusations of greed and having my integrity questioned, your reply did help. You pointed out an important detail I was overlooking with the spell kit. You also made me realize I need to spend some time defining what "business" "success" and "wealth" mean to me before I can start taking steps to achieve them. Finally, I hope it doesn't seem like I'm shrugging off your concerns and warning about greed. I do worry about climbing the corporate latter and being surrounded by that much greed and corruption. I think the best way to avoid getting involved in that kind of shadiness is to always do my job with integrity, honesty, and coming from a place where I want to help people. PeteySmoke wrote: Thank you for advice and concern Mary. I assure you my secondary (for now) business is honest. Granted, it's quite possible some people in the business may be motivated by greed and perhaps choose to do things dishonestly, but I can't imagine they last too long. You are right to point out that they are two separate endeavors so I need the spells to be separate. I guess I still see them both as "business" and figured one spell would help me achieve success in "business". That vagueness I feel about "business" and "management" is something I'm going to have to address to be successful. I do want to stress that they are bot legitimate jobs. My secondary business doesn't go against my day job. What I'm doing on the side does not in any way go against any company policies. My manager broke a policy when she introduced me to the business, but she did that to help me out and I am grateful. I have worked with investment bankers and CEOs, actually I have been married to two and have had quite a few as clients. They have told me similar stories as yours and they too thought they had friends in business. I have seen greed up close, but that is not the reason for my responses. Please reread your your first post. If what you are doing with these managers is ethical and above board, why can't your main job know about it? You called it a "hustle," not I. Put yourself in your main job's position, would you want you working for you with a side job that goes against company policy? From a magical perspective, if you are doing something that is not kosher to your main job, so it requires you to protect yourself. You are not doing your job with integrity if you are involved in a "hustle" and managers that are involved in it too. Fair enough, I did miss what you said about protection in your reply. Again thank you for helping me catch something I overlooked. Side hustle is just a term I use for any secondary business or source of income. Perhaps I should have used a different term. Again, thank you for taking the time to respond and providing me with some valuable insights. 1. If I'm expecting a promotion in say Oct and a good ranking in my job n say december can I perform the spell in Sep and combine both or will I need seperate kits everytime? 2. Also can I work on this kit when I'm also doing reconciliation work? i know I'll need energy for both but if ican manage to do that then is it ok? Coz i don't have an option both are important! path2success wrote: 1. If I'm expecting a promotion in say Oct and a good ranking in my job n say december can I perform the spell in Sep and combine both or will I need seperate kits everytime? That is your call. My advice would be to do the Crown of Success spell kit and then see what the effects are. You can combine both requests into your petition though the first time that you do the spell if that is what you are asking. path2success wrote: 2. Also can I work on this kit when I'm also doing reconciliation work? i know I'll need energy for both but if ican manage to do that then is it ok? If you are a beginner at rootwork then I suggest that you do not overwhelm yourself with work. Try one spell and then give yourself a little time before going to the next one. If you are a seasoned worker though or at the intermediate phase then working both spells should not be a problem. Thanks Bri! I'm a newbie but I'm gonna try if I can coz I do feel strong & divination also revealed that I can get success in my work so hope I can do it! thank you crown of success oil & sachet powder.. I bought the crown of success kit, but didn't take a bath in it yet.. but i did sprinkle the sachet powder on my resume and put some oil on my wrists..
i'm currently laid off, but i wanted an internship really bad, and i asked the company directly.. it was so sweet of them to jump through loops to make it happen, i think crown of success sure did push it a little..
thank you! hehe.. if this one's so powerful... i wonder how the attraction oil is.. lol it maybe eerily powerful for me! spell kit:glass candle holder broke- Continue spel or not? I have been doing an LM kit for success and everyday the 4" candle used to leave a tiny bit of wax in a heart shape. So today I prayed that the candle burn clear and leave no wax since that is a good sign. Well today it burnt clear and I picked up the holder - it was neatly cracked in 2 pices where the wick had fallen and burnt. I know vigils breaking is bad but now I dont know whether to continue or not and how to interpret this ? I know we should never leave spells incomplete. Re: spell kit:glass candle holder broke- Continue spel or not? You should finish up the spell but make a note of what happened and how it happened. the spell was going along just fine, leaving you a nice little puddle of heart shaped wax, very nice, then you wanted to hurry it along. You got what you wished for, there was no wax left over, but you also now have a broken candle holder which is never a good sign. So make a note about that and consider what the meaning(s) might be for the particular situation that you are working on, but yes, do finish the work. Also, just so you know, ceramic and glass holders tend to break really easily, and even Miss Cat acknowledges that sometimes these things break, especially if they get too hot. If your other signs have been positive then I might be less inclined to believe that the broken holder was a sign as much as a bi-product of fire meeting ceramic/glass. That being said, Bri is much more knowledgeable about these sorts of things, but I thought I'd throw in my two cents. Put the candle holder in a dish of water and put some appropriate bath crystals in the water. This will prevent the glass from getting too hot and the bath crystals will add to your spell. Thanks for the tip! I also noticed that using brass holders that LM carries is a nice option , the candle burns perfectly with them. One thing about vigils i noticed is if we put them in water the bottom portion wax does not burn , i realised after one vigil left an inch of wax, then i took off all the water and all the vigils burned clean!! Re: thank you crown of success oil & sachet powder.. Assume i perform Crown of Success LM Kit. Then next month I decide to perform it again. Can I reuse the mojo from the previous spell? i.e can I just order the altar candles , bath crystals,incense as that comes upto a fraction of the cost i may have to spend for a complete new kit with shipping. Also in doing this i resolve the issue of carrying multiple mojos. You shouldn't have to make or buy a new mojo unless you feel the one you have is dead, or if it has fulfilled its purpose. I bought the Crown of Success Spell Kit in the mail. RIght around the time it arrived I moved so I put off using it until after I got into the new place. Now because of this move I am far behind in my school work and need an extra push to get me through the rest of the semester. It seems that I can't seem to just get down to the work. Anyway, I got out the materials from the spell kit that I had packed away with my other supplies, and it would appear that I have misplaced the instructions that came with it in transit. Can anyone help? Thanks! If you are procrastinating, then you can work with St. Expedite. He is great for procrastination. BUT make sure you pay him. I got a crown of success kit and I am having a hard time understanding the following instructions. English is not my native language which may be the case for my confusion. Would someone please explain this? I understand making the form of a crown but, do the candle holders go inside or outside this layout? Where is the central crown-point and the jewel in the crown? Does the middle belong to the central crown-point? And then, the jewel is on the upper area? Also, the instructions require to repeat the spell for nine consecutive days but something concerns me. It mentions to do the spell before dawn. All of the hoodoo spells I have done have been during the night. I take my baths before dawn but I do the spells during the night. The problem that I have with repeating the spell before dawn is that I am a student. I will be doing this kit during this month's waxing moon and this happens to be the week before midterms. I just think it will be counterproductive to wake up earlier than usual before midterm week. If anything, I won’t feel very rested to pay attention during this crucial week. Additionally, on the last day of the spell, I am required to take another bath. Can I do this bath early and then complete the ritual during the night? Or would it be more efficient to do both the bath and ritual close in time? I wonder how important consistency is here. Now, if doing the spell during the night means less chance of success, then I shall wake up early but again, is this optional or a must for the spell to work? The candles go outside the crown layout (outline). Look at the crown on the packet and you will see how the jewel is centered at the top of the crown, just imagine that image as you pour the sachet powder. Follow the instructions, there is a reason why you should do the spell before dawn as dawn is the start of a new day and you are starting a new venture (right?). Following the instructions is according to tradition, many root workers will adjust certain elements as they get they feel comfortable. I would recommend that you follow the instructions for success. It is worth it and since you are working for success, believe me it is. Thanks. I shall follow the instructions. I see the crown on the package...so you mean that the mojo goes there and then, the incense brazier goes outside of the crown, right? The 'above the central crown point' means outside of the layout but on top of the crown, correct? Interesting, i never thought of drawing the crown on the label -- that's cool. I draw a little pointy crown, but the effect and placement of the elements is the same. The crown on the label is sufficient cat... I like the vintage look...please keep it. Most likely I'll be having MISC set the vigil light for me, but I'd be very much into hearing how things went with any of the CoS stuff. If working with these products helped you to accomplish a goal, etc., please post your stories here, or pm me. I'm very familiar with the awesomeness that is Lucky Mojo and I'm going to order *something* from the Crown of Success line soon, so no need to sell me-- I'm just interested in hearing what you used them for and what happened. I like to do a lot of research and reflection on different levels before starting any work to figure out what's best, and hearing from others is helpful. Re: CROWN OF SUCCESS products - What was your experience? Crown of Success is awesome. Each time I have used it the results were well 'successful.' 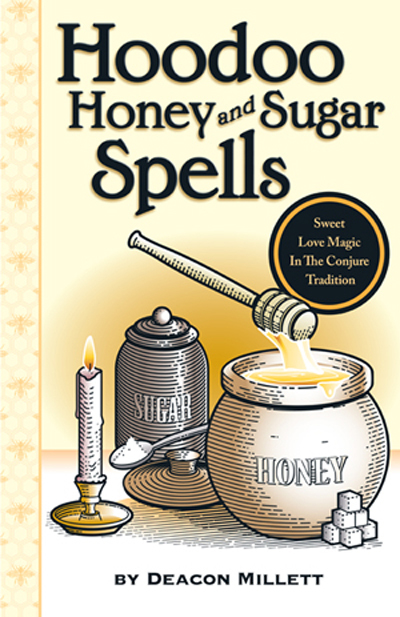 I have used the oils, complete spell kit, sachet powders, and incenses with results. Not saying this is a miracle worker because I had to put some work into what ever I was petitioning. It adds the umph! I needed. For one thing it gets you noticed. jwmcclin wrote: Crown of Success is awesome. Each time I have used it the results were well 'successful.' I have used the oils, complete spell kit, sachet powders, and incenses with results. Not saying this is a miracle worker because I had to put some work into what ever I was petitioning. It adds the umph! I needed. For one thing it gets you noticed. What, you mean the candles won't go to my office or the gym for me? Hehe. I understand re: the need to put work into it, absolutely. I feel it'll give me the edge I need as I'm starting again from zero; long story short, about ten weeks ago I left an extremely abusive 2+ year relationship, which ended when he was arrested for assaulting me. After dealing with all that through the available channels (moving out, pressing charges, getting a restraining order, starting therapy, resuscitating my social life, continuing my art, cleansing/healing/protective work, and of course cursing the living #@%* out of him), I'm in a good place where I have a lot of work to do that I'm excited about doing. I ordered a few things Friday; other LM supplies have always come through for me when I've used them as directed so I trust this line too. Would you mind sharing some ways you've used the different CoS products and the results you saw? Anyone else who's used them, please feel free to chime in as well. I'm only a couple days into burning and praying over this candle on my petition, but I feel good about posting this now because it's going so well. The candle and glass holder are lovely and I plan to reuse the glass with the labels still on as a vase, decoration, etc. Everything it's dressed with makes it look and smell wonderful, and seeing the herbs and sweet little stars in the wax makes me feel very happy and hopeful because I know the person who made it for me cared about the work s/he was doing and providing something to help me succeed. Actually, that goes for everything LM makes! Also, the sticker on the back including the full text of the 23rd Psalm is much appreciated, since I somehow *still* do not have it memorized 100%. (I tend to flip around verses.) Lol! It's burning nicely and giving me very clear signs. Best of all, it's working. Before even completing the burn I'm seeing movement in ways very specific to detailed requests in my petition; I've also discovered that with this item especially it pays to *be* specific, because the things I've asked are taking place to the letter. Amounts, timetables, and locations are matching up where I asked for them and manifesting more vaguely where I did not. The results I'm seeing in immediate and short term matters is very encouraging as I wait and work for the more long-term parts of my petition to develop. I'm happy your seeing results I have crown of success oil, and so far its worked amazingly! Can Husband and I share the same kit in different rooms? I'm wondering if we purchased the "Crown of Success" Kit could we share the same kit in different rooms? And when we do the Crown of Success in different rooms should we have some kind of protection to keep unwanted forces from separating us? We Love each other and I just don't want anything to come between us. Can we bath together with the "Crown of Success" crystal bath? Thanks in Advance for any help you may give me. Re: Can Husband and I share the same kit in different rooms? Are you both working it for the same purpose? If so, then you can work the kit on behalf of both of you. If you're working for different aims, then you should each use a seperate kit. I would take separate baths, though, so you can each get the full value, rather than splitting the value between you. I would do separate kits in that case. Each of you focus on your own specific career. You won't be sharing the success, so you need to work individually. I've got all of those oils too, but I seldom think of wearing them. I use them to annoint candles. I think I'll start "anointing" myself. I unfortunately need to work in private at this time, and really don't have a place to do an extended candle ritual. The Crown of Success spell kit is done over a period of nine days, and this has prevented my from doing the full ritual. I have been telling myself forever that I'd "get around to it", so I'm trying to find a way to modify things. I can work with the mojo bag pretty easily, do the instructions as is. I'm thinking of doing the bathing and candle lighting all in one day. Certainly wouldn't be as effective as the full ritual, but it would be much more than I've done. Would there be any reason not to do so? Also, with the intent for the mojo bag, should it be something specific I have in mind, say a particular job or salary, or is it better to focus on qualities, such as generally making more money, being successful in my career advancement, etc.? The candle ritual can be done in privacy...if you have a small portable altar that you can put away when finished each day. As for effectiveness...it depends on your abilities, your strength, your prayers...your focus... Also LM sells a prepared mojo with instructions... there are a lot of options, just have to be motivated to which one is best for your needs. I use my computer desk as my alter I have a laptop so I just take it down. Anyway I have a cloth to cover it I use a sheet. After work I simply put the materials in my upper dresser drawer as far as candles go with smaller ones I just leave on top of my night stand which severs as a smaller alter. The fixed jumbo candles I've bought from LM I keep burning I simply place them under my nightstand. As far as incense what I did which was a tip I got on here was started burning incense in my room. When my sister in law asked what that smell was I just told her an incense stick and showed it to her. Plus I open a window. Just never leave things lying around and do your work at night when ppl are asleep granted you might not get a good nights sleep but the results of your work outweight staying up awhile past bedtime lol.